Open SimpleMind and tap menu to open the Mind Map Explorer. Tap the share icon, on smaller screens select "Export all Mind Maps" from the overflow menu. This creates a .smmstore archive with all Mind Maps and other relevant information. Send this archive to an App of your choice, for example the Dropbox app or mail app. To restore the backup, tap "import file" from the (overflow) menu and locate the .smmstore archive or locate the file. Note! Some Android phones seem to remove the .smmstore extension. When you see "filetype not recognised" please check if Android has not removed the .smmstore extension and add this manually. 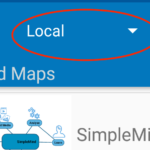 Open SimpleMind and tap "Mind Maps" to open the Mind Map Explorer. Tap the Share icon in the bottom left corner. Select one the exporting options. This creates a single archive with extension .smmstore containing all Mind Maps and other relevant information. To restore the backup, import the .smmstore archive. 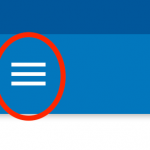 This depends on where you stored it: open it from the built-in cloud, via files or from your e-mail. From the main menu select "SimpleMind" - "Preferences". Select "Local Mind Maps" - "Export Store". This creates a single archive with extension .smmstore containing all Mind Maps and other relevant information. To restore the back up, use "Import Store" in the same panel.